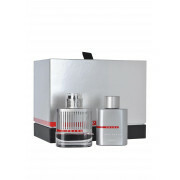 A fragrance gift set for men from Prada containing 50ml eau de toilette and 100ml shower gel. This is a designer masculine fragrance with floral scent, top notes of bitter orange and lavender, middle notes of clary sage, mint and bottom notes of ambrette and ambroxan. This fragrance set comes in a ready to present gift box.